In the 1950s and 60s, Detroit TV offered a wonderful assortment of ”Video Babysitters”. From Captain Jolly and Sagebrush Shorty to Wixie and Soupy Sales, I watched them all. They were all pretty terrific to my 8-year-old eyes, but my favorite, by far, was Ricky the Clown. Fast-forward about 40 years. When I created my website dedicated to local Detroit kids TV, Irv “Ricky the Clown” Romig was the first person I interviewed. Irv and his lovely wife Rosie welcomed me into their home and treated me like an old friend. At this stage in his life, Irv was well into his 80s. His body was pretty beat up from the years of rough and tumble acrobatics that he performed in professional circuses for most of his career. Irv walked with a very pronounced limp. His doctor wanted him to have a knee replacement, but at his age he was reluctant to have the operation. Irv wasn’t doing a lot of personal appearances as Ricky anymore, but he came up with an ingenious gimmick that he used for school assemblies. He would walk on stage in his street clothes, and introduce himself as Irv Romig. He then sat on stage in front of a small mirror, with his clown makeup and props gathered around him. As he put on his makeup in front of the audience, he would explain the history of clowning and the circus. Now, what happened next always amazed me. 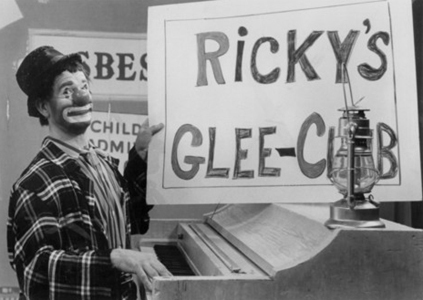 I like to call it Ricky’s Clown Magic. While Irv put on his Ricky makeup, his voice would get progressively higher. It was so subtle, that it would take you a while to notice it. As he put on his clown face, his posture would straighten, and, I swear, 40 years would melt off of his body. When he put on his wig and derby to complete the transformation, he would step away from the table as Ricky the Clown, then do his act for the next half hour. Remember the bad knee that I told you about? Not only did Ricky have no trace of a limp, he would do a comedy cowboy bit where he twirled a lasso around his body and jumped repeatedly thru it. Ricky would then play the bugle, do a few funny bits, perform a couple of magic tricks, followed by questions from the audience. When the show was over, Ricky would quickly make the transformation back to Irv, complete with hunched back and bad knee. Irv would always tell me that he was a has-been, but it’s better to be a has-been than a never was. I would remind him that Ricky was, and will always be, my hero.